It takes just one look to fall in love with the work of internationally acclaimed artist Range Murata. And that is all it will take to fall in love with this beautiful PVC statue inspired by Murata-san's own personal illustrations. 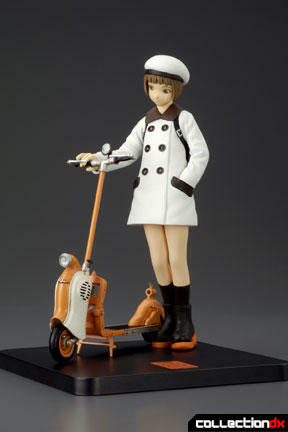 Skipper w/ Motor Scooter from the Range Murata PSE Pro Collection perfectly captures Murata-san's soft, ethereal style, as well as his highly-detailed, organic mechanical creations. The set comes complete with 6" scale figure, motor scooter and display base, all packaged in a collector's style window box. Previously available only in Japan in both orange and silver, this white color variation has been specially developed for the international market at Yamato's request. A truly genuine treasure. What's a boy to do? One could be his long-lost sister, the other could be the love of his life! But which one is which? Fortunately, you're not faced with that dilemma because both Karen and Miina can be yours with these wonderful PVC statues from Yamato's Story! Image! Figure! EX collection. Crafted by Japan's ZERO (CLUMSY CLAFT), these statues inspired by the hit anime Please Twins! (spin-off of Please Teacher!) perfectly capture the mischievous innocence of the two main characters Karen Onodera and Miina Miyafuji. Window boxed, Karen and Miina are sold separately, but destined to be displayed together! 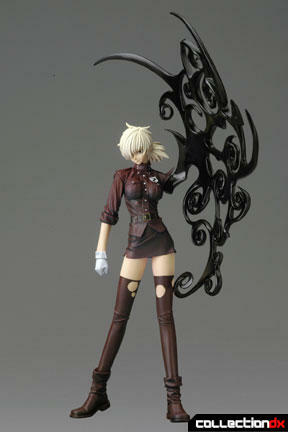 Ripped from the pages of Kohta Hirano's vampire epic, Hellsing, comes this 7" scale PVC statue of everyone's favorite "Police Girl", Seras Victoria as never before seen. Crafted by Japan's NANASHI as part of Yamato's Story! Image! Figure! EX collection, this statue depicts the sultry Seras with meticulous detail as she glares menacingly upon her enemy... oh, and did we mention that really wigged out arm? Window boxed, this is one collectible that Hellsing fans will be dying to sink their teeth into. The Golden Age of the Hawk Soldiers comes to life in this fifth assortment of miniature trading figures inspired by Kentaro Miura's internationally acclaimed anime / manga Berserk. Featured in this collection are characters both old and new including Guts, the BlackSwordsman; Judeau; Corkus; Pippin; Rickert; and Wyard. Clamshelled, each figure measures between 3" - 4" and comes with display base. A high quality, must-buy collectible for the Berserk enthusiast. Experience a new vision of a classic hero with the Guts Armored Berserk PVC Statue! An accurate reproduction of the sold out resin statue developed by the artisans of Art of War under the strict supervision of Berserk creator Kentaro Miura, the Guts Armored Berserk PVC Statue recreates the dizzying scene in which Guts the BlackSwordsman confronts the fierce Gurunberd. 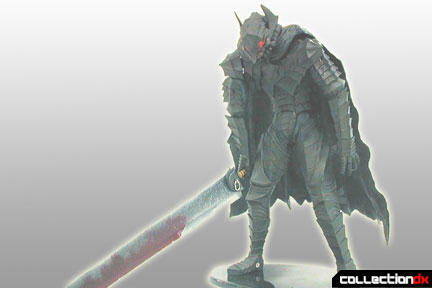 Window boxed, the Guts Armored Berserk PVC Statue comes with sword and display base. 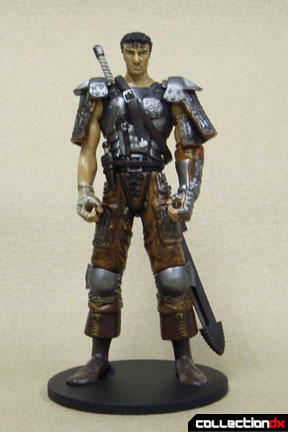 An inspired collectible for Berserk fans, as well as fantasy fans in general. Experience a new vision of one of the most requested characters from the annals of Kentaro Miura's internationally acclaimed anime / manga Berserk with the ZODD Flying PVC Statue! The overpowering presence of this statue brings about a chilling effect as ZODD, aloft above the Tower of Condemnation, glares upon his enemy shortly before taking off for battle. 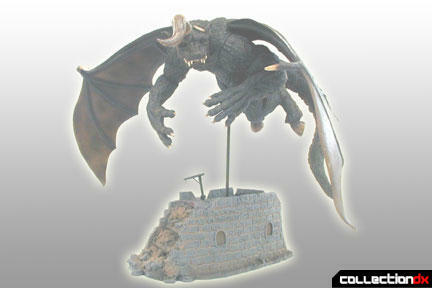 Window boxed, the ZODD Flying PVC Statue comes with themed display base. A unique and genuine treasure, not only for Berserk fans, but for all fans of fantasy. For further information about these and other fine Yamato products, please visit the Yamato USA website at www.YamatoToysUSA.com.